Get 5% off a Berkey water filter system and accessory. Applies to Travel, Big, Royal, Imperial, Crown, and Light systems. 5% off automatically applied when added to cart. 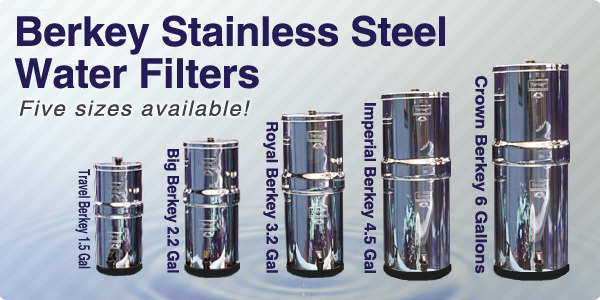 What is a Berkey Water Filter? A complete standalone gravity filter system. Requires No electricity - Does not have to be connected to your home plumbing system. Filters 6000 gallons per set of 2 black Berkey filters = Costs only pennies per gallon. Ability to remove/reduce chlorine, fluoride, pathogens, VOC's, heavy metals, and more. See the complete list here. Why Buy a Berkey From GetBerkey.com? Superior customer service before and after the sale. We offer the most choices and best prices. Get 5% off a Berkey system when purchased with accessory.